Hey friends! 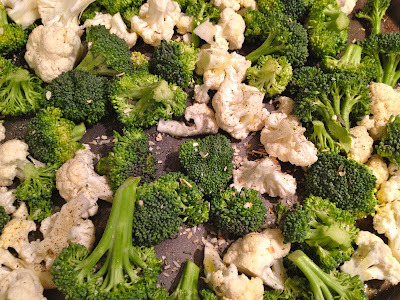 I've got another awesome roasted veggies recipe for you! Ever since I made the most amazing roasted green beans I've become obsessed with roasting vegetables. I love how crispy it makes the veggies, while also adding sweetness and loads of flavor to the vegetable. If you haven't tried it yet, now is the time! I swear I was never someone who told other people how amazing vegetables are. (Jessie and Rachael can back me up!) But as I've worked toward leading a healthier life I've really enjoyed how it feels to eat healthy. I'm full longer, have more energy and my body feels great. Now, when I wasn't eating this way I called BS (bologna sandwich) when people said all this mumbo jumbo. But give it a few weeks and I swear you'll agree. Do it with me! We can conform together and feel great about ourselves. I'm already starting to. Join me! Forgive my pictures...I took them when they came out of the oven, but not again after I had actually set them out to eat. They were my lunch all week, and I apparently was too hungry to remember to photograph them. Whoops! *Spread broccoli and cauliflower florets onto sheet pan. Drizzle with olive oil. Sprinkle seasonings on top. Mix on sheet pan. *Roast in the oven for about 30 minutes, or until tender and slightly crisp.